Okay - time to talk haircare. My hair is always a bit of a 'mare if I'm completely honest - it's very dry (as is the way with being a blonde) and as it's quite long, it's gets oh-so knotty, all the damn time. 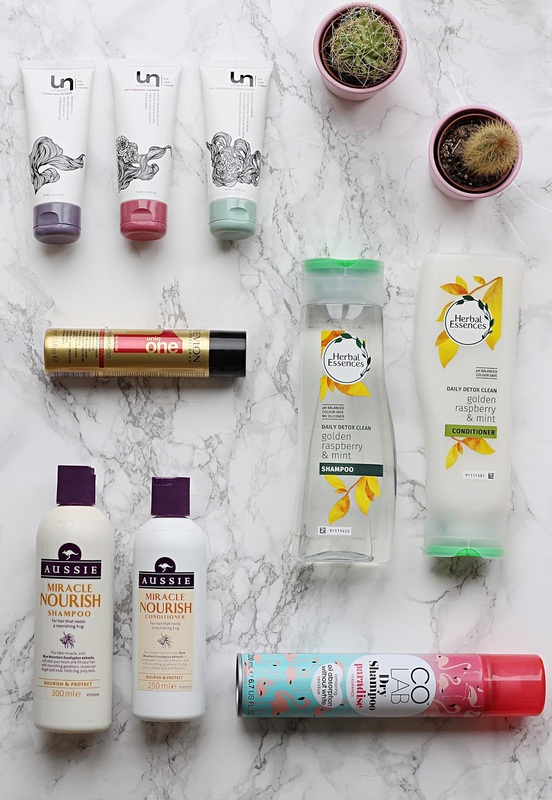 This being the case, I'm always on the look-out for new haircare products to try, and having recently come across quite a few new products, I thought I would share my thoughts on them with you! Okay, so first up is a brand that I am so, so excited to share with you guys. Unwash is all about 'a new level of clean' - unlike most shampoos, it aims to cleanse your hair without inflicting harsh chemicals that strip the moisture onto it. I was a little sceptical at first - I mean, surely a product that veers away from usual cleansing won't clean my hair as well, right? Wrong. I absolutely love this stuff. The new Bio-Cleansing Conditioner (used in place of shampoo) doesn't really feel like it's cleansing when you're using it (as it's much gentler) but it really does give your hair an amazing clean whilst keeping it feeling nice and healthy. The Bio-Cleansing Conditioner combined with the Hydrating Masque is honestly the ultimate dream team - my hair has never felt so good after using these too. It's easy to comb through when wet (something which is simply never possible with my hair) and my hair looks and feels so healthy, hydrated and nourished. If product build-up is something you worry about, the Anti-Residue Cleanse is another product from Unwash that does exactly what it says on the tin, getting rid of product build-up and oil. So much love for this brand! I'm completely obsessed with the Revlon Uniq 1 haircare range - their All In One treatments are honestly my Holy Grail when it comes to haircare, so I had high hopes when I heard they were bringing out a dry shampoo. Sadly, after trialling the dry shampoo for a few weeks I have to say, I'm not impressed. It claims to have '10 real benefits' and whilst it does smell good, and feel nice on your hair, it just didn't do it for me in terms of keeping my hair grease-free. Whereas other dry shampoos would make my hair look fresh instantly, this one by Revlon really didn't. It's a shame as I have nothing bad to say about any of the other Uniq 1 products - just disappointed that this one doesn't compare to the rest. Whilst I didn't include them all in the picture, Herbal Essences has released a new range of 'Daily Detox' shampoos, including 'Shine', 'Clean' and 'Volume'. The Daily Detox range aims to naturally cleanse hair of daily residue, without the use of silicones or parabens, leaving it healthy and clean. Each variety has a different scent, all of which are super fresh and clean-smelling, particularly perfect (I think) for the summer months. If you wash your hair in the morning these are a must-have, as they're so fresh and energising to use, they'll really wake you up for the day. I really recommend them and for the price, you can't go wrong! Not long ago Aussie released their new Miracle Nourish range and being a big fan of Aussie's products, I just had to give it a go. Featuring a shampoo, conditioner and the famous 3 Minute Miracle deep treatment, the Miracle Nourish range is all about nourishing and hydrating your hair, or, as it states on the packaging, giving it a 'nourishing hug'. I was excited to try it, as I've found pretty much all of Aussie's products I've tried in the past to be pretty nourishing, but sadly I wasn't blown away by this. Don't get me wrong - I don't hate it - the range just isn't something I think I'll be rushing out to purchase any time soon. One of the things I love about Aussie's products is the smell - and this one just didn't smell the same, which I think disappointed me from the off-set! Say hello to my new favourite dry shampoo! I'd heard all the hype about Colab when it first came out, but after being a Batiste girl through-and-through, I didn't really feel the need to look for an alternative. However, I'm not one to resist a good offer, or pink flamingo packaging, so naturally I had to try the 'Paradise' version to see what all the fuss was about. And boy, am I glad I did. This dry shampoo is honestly the best I've ever tried - it smells great, it doesn't leave your hair looking all grey and dusty and, most importantly, it keeps your hair looking and feeling super fresh. This is probably a bit grim but I actually went for almost two weeks without washing my hair thanks to this bad boy - it's that good. For the price I really don't think you can go wrong. What haircare products have you been trying lately? Let me know!